This set of MATLAB Question Paper focuses on “Operations on Signals – 2”. Explanation: The length of the first vector given as an input to the plot command is not equal to the length of the second vector given as an input. Hence, the above code will result in an error. If the first vector was ranging from [-4:1:4], the output would’ve been Generates a triangular pulse signal only. Explanation: Mathematical operators like ‘+’, ‘-‘ do not work on cellular arrays. Hence, the above code will lead to an error in MATLAB. Explanation: Since we have used the hold command, we can now plot multiple graphs in the same window. The 1st plot command generates a ramp function from 0 to 2 units in time while the 2nd ramp function generates its mirror image in the same window. There is no error in the above code. 4. Discrete time convolution is not possible in MATLAB. Explanation: We need to define the signal in terms of vectors and then we can give them as inputs to the conv() command. This will result in the discrete time convolution. 5. plot([0:1:8],[rectpulse(1,9)]’) and plot([0:1:8],ones(1,9)) will generate the same graph. Explanation: ‘rectpulse(1,9)’ generates a column vector of 9 1’s. Since we have transposed it, the resultant is a row vector of 9 1s. ‘ones(1,9)’ also generates 9 1’s as a row vector. Thus, the above codes will result in the same graph. Explanation: The signal given to us is delayed by 5 units in time. If we advance the signal by 5 units, the signal amplitude is 0 for t<0 but A for t>=0. Hence, the signal will be causal. Explanation: The signal changes from 0 to 1 from t=5 to t=6 seconds. This indicates a ramp function starting from t=5 seconds. But again it remains constant till t=10 so it signifies that the same signal is subtracted by a ramp function at t=6 seconds. Finally the signal ends at t=10 seconds so a unit step signal gets subtracted from the previous signal at t=10 seconds. Explanation: The deconv() command is used for polynomial division. Since it will first return a quotient, l=2. It will next return the remainder which is 0 in this case and hence, m=0. Explanation: The rectpulse command generates a column vector so it cannot be concatenated with row vectors ie with zeros. If we had taken the transpose of the vectors generated due to the rectpulse command. It leads to an error. Explanation: The length of the signal to be plotted, which is given as the y axis, is 24 while the length of the x axis is 23. This leads to an error since both the vectors has to be of same length. 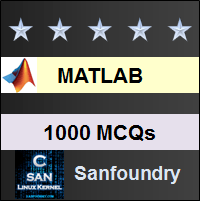 To practice all questions papers on MATLAB, here is complete set of 1000+ Multiple Choice Questions and Answers.